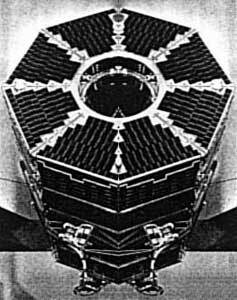 The OV3 (Orbiting Vehicle 3) series were experimental satellites based on an octagonal bus structure. These were the only in the OV series launched on dedicated launchers. OV3 4 was also called PHASR (Personal Hazards Associated with Space Radiation) and OV3 5 and OV3 6 were called ATCOS (Atmospheric Composition Satellite). J. W. Powell and G. R. Richards, “The Orbiting Vehicle series of satellites”, Journal of the British Interplanetary Society, Volume 40, pp.417-426, 1987.